Lindsay is out doing BLUE sightings right now. Hope she finds it everywhere. Congrats to you both!! WOW! Reading the brief summary of the story of Blue and Egg brought tears from my eyes! Very touching – and the illustrations are beautiful! Congratulations to both of you! 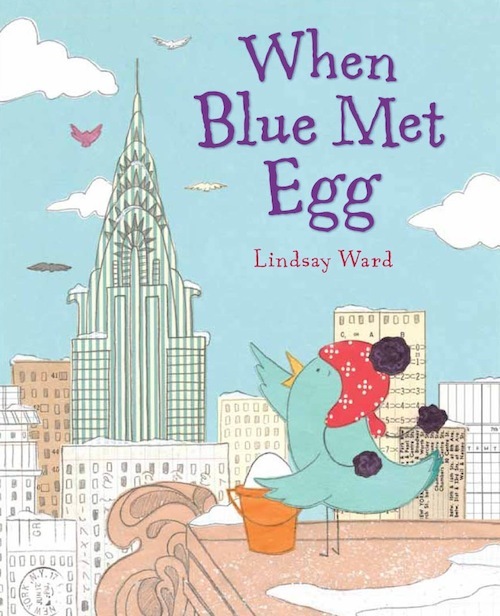 WHEN BLUE MET EGG sounds lovely (and looks adorable) — I must trek to my Indie shop to find a copy. My copy arrived the other day and I LOVE it. The art is lovely and the story is delightful. Congratulations to you both. Congratulations to Lindsay! Her book looks absolutely charming. Congrats! I will hit my local independent bookstore and ask for it. They have been in the biz for 22 years now and are fabulous! So exciting! Got my copy and am super-excited about going to Lindsay’s book party Friday night! This book is GORGEOUS. And what a great story! YAY, congratulations. Have been waiting for this one! Congrats, Lindsay!!! I’ve been looking forward to reading this book ever since Mary first mentioned it. I’m sure I’ll love it. How exciting! I loved reading the story behind the story. Congrats to both of you (Mary and Lindsay)! I’ll have to watch for this book. We have a new, independent bookstore in our village (hooray!) so my little one and I will definitely be stopping by to look for this. Many, many congratulations. I just took my son to story time at Barnes and Noble, and guess what book was the featured story? This one! It was a hit. Congratulations on the release!